Pamplin Media Group - GLAZER ROCKS! For a teenage Peter Glazer, it was a perfect musical storm. The coming of Glazer's adolescence coincided with the arrival of The Beatles, the British Invasion and eventually the psychedelic music explosion that provided a soundtrack for the cultural revolution of the mid- and late 1960s. With his ears constantly tuned to local Portland radio, Glazer seized upon a song from an upstart band from Los Angeles whose haunting sound soon would take over the airwaves. "I just loved 'Light My Fire' by The Doors," says Glazer, a Lake Oswego attorney. "There was a little station in town (KGAR, at 1550 on the AM dial) that played it and promoted it. The Doors came to town in July of 1967, and I had a pass to get into the concert. Afterwards, I got to meet the band. I got autographs from all four of The Doors." During those formative years, Glazer collected all sorts of rock 'n' roll memorabilia. Along with autographs, he gathered items such as local coffee house handbills, concert posters and radio station record surveys. The collection followed him to college but eventually got left behind at his mother's house as he moved on to adult life and a career as an attorney. Years passed until Glazer's mother reached out and asked him if he would like his collection back. The notion begged the question from Glazer, "What am I going to do with all this stuff?" About five years ago, Glazer approached The Oregon Historical Society about donating his unique collection of memorabilia. A longtime supporter of OHS, Glazer's only condition for donation was that the items be put on exhibit for the public. OHS agreed and now has made good on its promise. 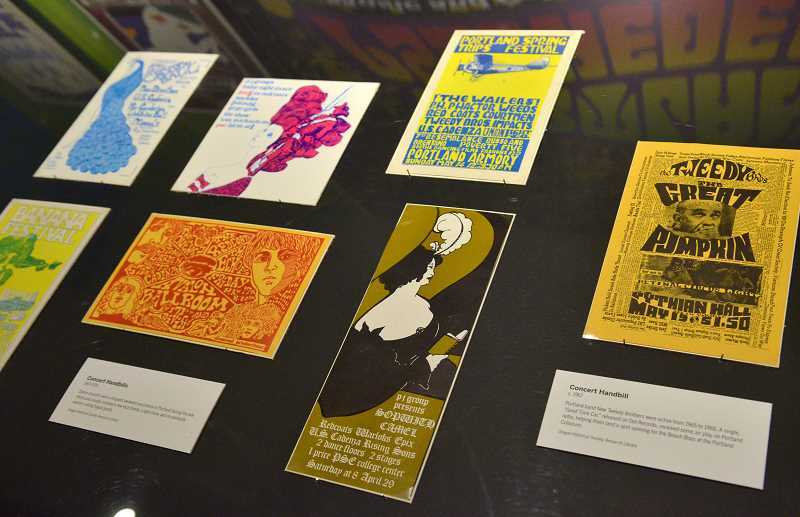 Currently up and scheduled to run through March 17, 2019, "Portland Psychedelic: Music and Culture in the Rose City and Beyond, 1966-1972" is a colorful trip down memory lane that is delighting curious visitors to the downtown Portland exhibit. Curated by OHS's Lori L. Erickson and designed by Bryan Potter Design, the exhibit's features are almost exclusively items from Glazer's collection. 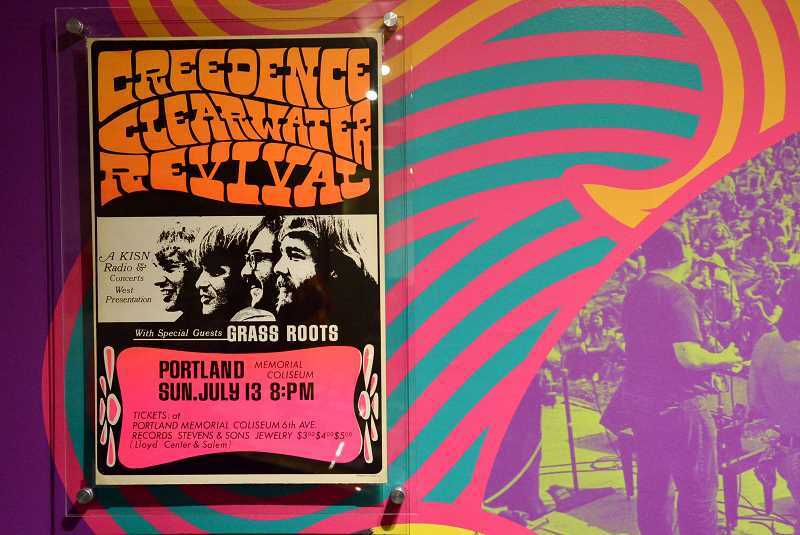 Concert posters from The Grateful Dead, Jefferson Airplane, Buffalo Springfield and Led Zeppelin are among the dozens on display, as well as coffee house handbills promoting local Portland bands from the era, such as U.S. Cadenza, Notary Sojac and Melodious Funk. 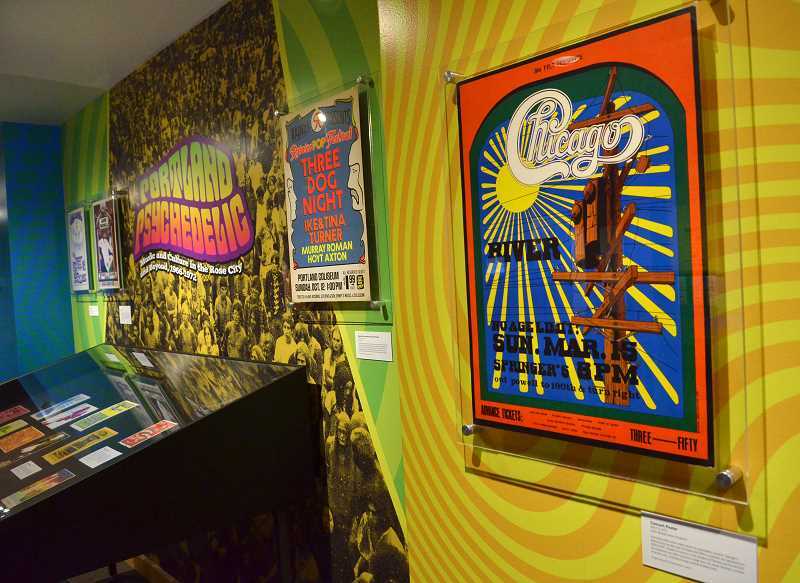 With more than 100 items on display from Glazer's collection, the exhibit is designed to capture the look and feel of a time when local hippies crowded into smoky coffee houses to soak up the blossoming counterculture. 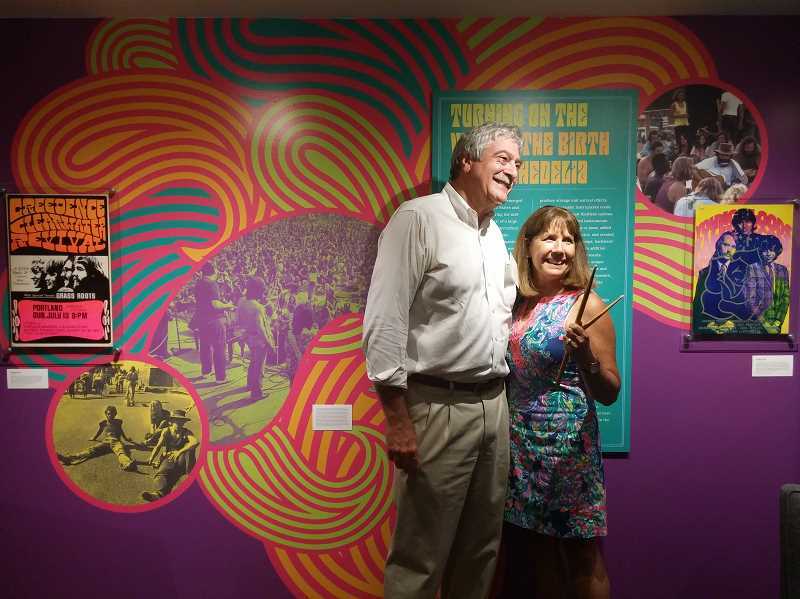 "I was conscious of the '60s music scene nationally, but not really familiar with what was going on locally," OHS's Erickson said during a tour of the exhibit last week. "It's amazing how much was going on, a lot of it very close to here. The Doors played across the street at the Masonic Temple, and there was a psychedelic coffeehouse right in the church across the street. It was happening all over town." At first, Erickson wasn't sure how to pull all of Glazer's donated items together for exhibit. But she was shocked by the excellent condition of most if not all of the items. "You would assume once things start to age about 30 years that they're going to have some yellowing, but a lot of these were in great condition," she says. "They're not even yellowed. I think it's a great record of what was going on at that time." Glazer says he didn't do anything to preserve the items "or treat them with any great respect, but these people at the historical society made them into something very special and created an exhibit that tells a story that is really interesting. "I love what they did with that stuff," Glazer says. Glazer says he never really intended to build a collection of rock 'n' roll memorabilia, and he's quick to give credit where credit is due. "I give the credit to my late mother," he says. "Most mothers would tell their kids to 'get this crap out of my house,' but my mother was nice enough to say, 'You can take it when you want it. It'll be here.' And she basically safely kept all of this stuff. A lot of it didn't have any monetary value, but she just didn't throw it all away." At least two pieces of Glazer's collection actually did prove to have some monetary value. One is a sheet of paper that contains the autographs of all four members of The Doors; it serves as a sort of centerpiece for the OHS exhibit. The second is a sheet of paper that contains the autograph of the band's iconic singer, Jim Morrison, who died just a few years later at age 27; Glazer donated that one to the Lakewood Center for the Arts when he donated the other items to OHS. something he still treasures today. "I have friends who will tell you I'm time-warped and still stuck in the 1960s," he says. "Well, that's not entirely true, but it's partially true. I'd rather listen to Sirius XM's '60s on 6' than most other radio or other music options." Hours: Monday-Saturday, 10 a.m.-5 p.m.; Sunday, noon-5 p.m.